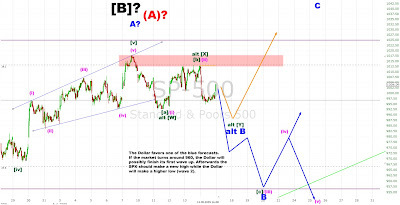 Technical Analysis and Elliott Wave Theory: What a mess! The short term picture is actually very unclear but it looks like we've got a wave [a] from 1018 to 992, [b] from 992 to 1013 and are now in [c]. This [c] should conclude wave B somewhen next week. The following wave C should carry the market to new highs.